A French fur thief named Subienkow, who has been held captive by a native tribe, tries to come up with a plan to avoid being tortured. 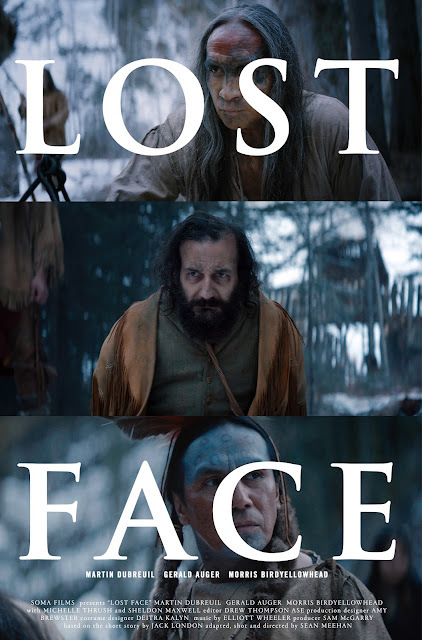 "Lost Face" is a short film adaptation of a Jack London short story of the same name. A French fur thief tries to outwit tribe's chief, Makamuk, and thinks of a story that will save him from torture, though this story may embarrass Makamuk in the long run. This is an extremely gorgeous looking short film. The way it is shot is visually stunning and can be overwhelmingly gritty. In 14 short minutes, we also see a tremendous display of acting from everyone involved. Technically speaking, there is nothing wrong with this short. We cannot say the same for the narrative. We don't really feel the events leading up to its end justify the conclusion of the story. Sometimes things work better on paper than they do screen, and we have an inkling that may be the case with "Lost Face." We understand what director Sean Meehan is trying to do and say in this story in regards to power dynamics. We are clearly in the minority because all of the reviews we have read for this short are glowing. We remained quite engaged by it up until the end, but nonetheless, this is an incredible looking short with excellent and authentic production design, costuming, and acting. To see the trailer for "Lost Face," click here.